Once submitted, we will try and place you in contact with a suitable Reconnaissance Robotics supplier within 48 hours. 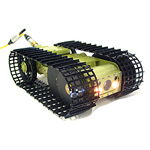 Variable Geometry Tracked Vehicle from Inuktun Services Ltd.
Crawling Robots from Rhydo Technologies Pvt. Ltd.